During the aftermath of the financial crisis of 2008-2009 millions of Americans lost their homes, jobs and life savings. As regular Americans suffered, the federal government spent arguably in excess of a trillion taxpayer dollars propping up the financial industry. In 2016, Bernie Sanders campaign was fueled as he railed against the excesses of “Wall Street” and a populist uprising sent Donald Trump to the White House. The crisis, bailout, financial fallout and political revolt can be traced to fraudulent and criminal activity at large financial institutions. These institutions collectively are the “Wall Street” that were the targets of Sanders’ ire and their arrogance an element of the sense possessed by Trump supporters of being forgotten. Regarding these institutions and their executives, the public expected “justice” for the financial crimes that cost millions so dearly. How many of those involved at the highest levels went to jail? NONE. 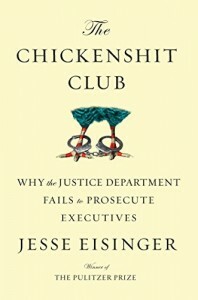 In The Chickenshit Club, Pulitzer Prize winning investigative journalist Jesse Eisinger examines why United States Department of Justice prosecutors have become ever more hesitant to charge business executives with financial crimes. The book’s title comes from a 2002 talk by then US Attorney James Comey’s to the prosecutors in his charge. Comey had called the attorneys to a meeting and asked for a show of hands. “Who has never lost a case?” he asked. Hands proudly shot up around the room. Comey then announced that undefeated prosecutors clearly had avoided hard cases and belonged to a group with an embarrassing name — The Chickenshit Club. In the wake of the savings and loan crisis of the 1980s and 1990s (which resulted in the failure of 1,043 out of the 3,234 savings and loan associations in the United States), the federal government prosecuted and obtained convictions of more than 1.000 corporate executives. The pursuit of executives for fraud upon investors and the public would reach a high water mark with the convictions of Enron executives Ken Lay and Jeffrey Skilling. The Chickenshit Club opens with how the Enron case was built and prosecuted. After Enron and the related conviction of accounting giant Arthur Anderson, the government response to executive criminality gets softer and softer. The devolution of the Justice Department since Enron has filled it ranks with members of the Chickenshit Club, most of whom are richly rewarded upon leaving the department. Eisinger tracks why and how this happened: the revolving door between large law firms and government agencies, a government policy that allows the criminals to investigate themselves, deferred prosecution agreements and headline making fines that punish shareholders but not criminals and do nothing to compensate victims. Eisinger lifts the veil from the Justice Department and its relation with “Wall Street”. Bernie Sanders gave voice to the ire against “Wall Street” and Donald Trump’s victory reflected the sense Americans have that they have been forgotten. 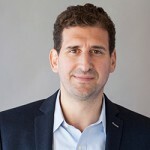 With The Chickenshit Club, Eisinger explains that what Americans feel at a gut level is really true: there is a system of “justice” for the executives of major corporations and institutions that is without accountability for criminals and another system for everyone else. In The Chickenshit Club can be found underlying causes for the surge of Bernie Sanders and why Donald Trump’s mantra of “drain the swamp” has such resonance with Americans. No top level executives at any Wall Street financial institution went to jail. 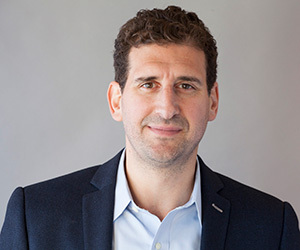 Arguably there was one conviction of a single banker, and this was by way of a guilty plea by Kareem Serageldin.